Ever since I saw them in Seattle last year, I've wanted a pair of Swedish Hasbeens boots. I flirted for awhile with No. 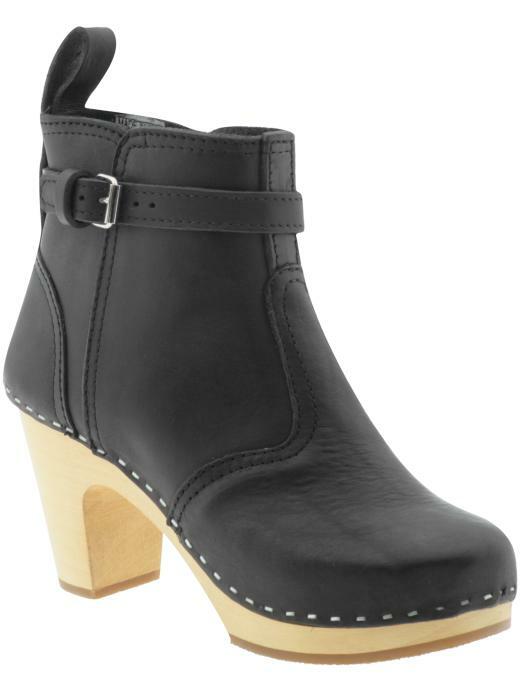 6's clog boots, and Jeffrey Campbell even debuted a knockoff style this fall, but Hasbeens just seemed more sturdy and well-made. So last week I finally bit the bullet and ordered the high heeled jodhpur boots, and after I got over the panic of paying that much for a pair of shoes, I must say, I'm incredibly happy with them. The wooden sole takes a little getting used to (it's inflexible, so you kind of have to march in them) and the leather needs to be broken in a little, but the sole is incredibly comfortable--I wore them all day today while running from meeting to meeting in Midtown--the heel is totally manageable, and the boots are incredibly well-constructed, with hidden elastic gussets and a layer of rubber on the sole so that they're not slippery. These are the kind of boots that are going to get even better with age, and they truly enforce the idea that you get what you pay for. Consider them money well spent.